Another assist for on-loan Cobblers defender Joe Bunney was not enough to prevent Rochdale from sliding closer to the Sky Bet League One trapdoor on Saturday. 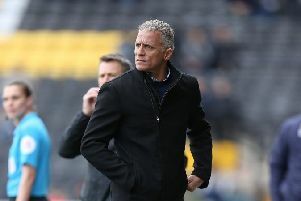 Bunney’s low cross on 27 minutes saw Ian Hendersen give Dale a shock lead against high-flying Sunderland, but the Black Cats levelled through Charlie Wyke before George Honeyman scored an 89th minute winner to keep Rochdale in the relegation zone. Billy Waters also played the full 90 minutes as Cheltenham Town were held to a 1-1 draw at home to Exeter City. Conor Thomas cancelled out Dean Moxey’s first-half strike before Exeter goalkeeper Christy Pym was sent off for a push on Waters. Joe Iaciofano lasted an hour for Banbury United during their 2-0 win over Lynn Town in the Southern League while both Camron McWilliams and Jack Newell missed Corby Town’s victory at Aylesbury United with injury. Matthew Slinn impressed by all accounts as his Cogenhoe United side were 1-0 winners over Rugby Town. Meanwhile, Northampton Town Ladies were convincing 4-1 victors against Corby Town Ladies at the PTS Academy Stadium on Sunday. Emma Billenness opened the scoring on 22 minutes, Georgia Tear made it 2-0, Partridge added a third before half-time and then Alex Bartlett rounded out the scoring.